ALTA FLORESTA, Brazil, Sep 19 2017 (IPS) - The deforestation caused by the expansion of livestock farming and soy monoculture appears unstoppable in the Amazon rainforest in the west-central Brazilian state of Mato Grosso. But small-scale farmers are trying to reverse that trend. Alison Oliveira is a product of the invasion by a wave of farmers from the south, lured by vast, cheap land in the Amazon region when the 1964-1985 military dictatorship aggressively promoted the occupation of the rainforest. “I was born here in 1984, but my grandfather came from Paraná (a southern state) and bought about 16 hectares here, which are currently divided between three families: my father’s, my brother’s and mine,” Oliveira told IPS while milking his cows in a barn that is small but mechanised. But what distinguishes his farm, 17 km from Alta Floresta, a city of about 50,000 people in northern Mato Grosso, is its mode of production, which involves an agroforestry system that combines crops and trees, irrigated pastureland, an organic garden and free-range egg-laying chickens. 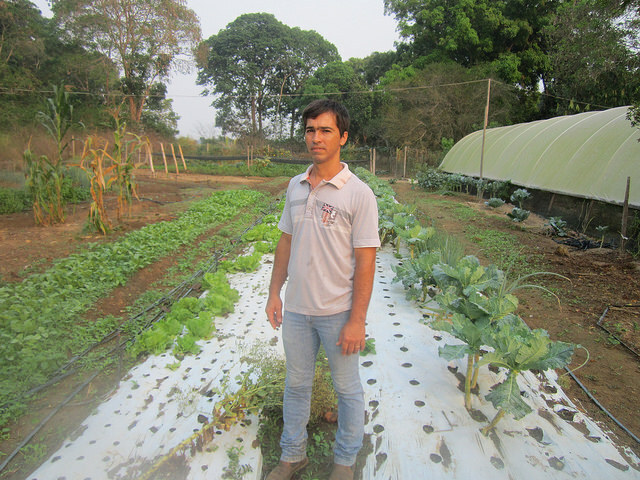 Because of its sustainable agriculture system, the farm is used as a model in an Inter-American Development Bank (IDB) programme, and is visited by students and other interested people. “We want more: a biodigester, solar power and rural tourism, when we have the money to make the investments,” said Oliveira’s wife, 34-year-old Marcely Federicci da Silva. 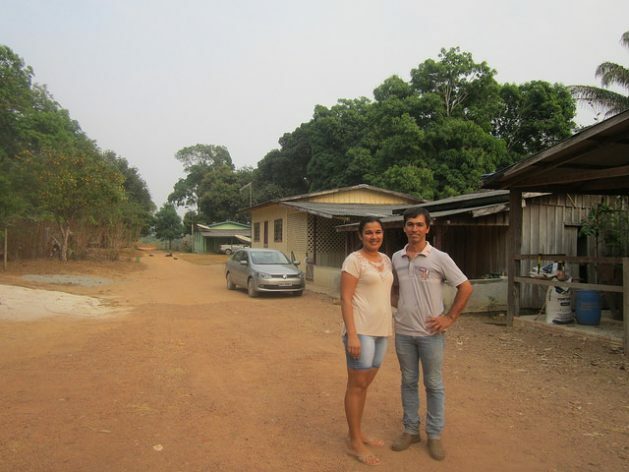 The couple discovered their vocation for sustainable farming after living for 10 years in Sinop, which with its 135,000 people is the most populated city in northern Mato Grosso, and which owes its prosperity to soy crops for export. “Raising two small children in the city is harder,” she said, also attributing their return to the countryside to Olhos de Agua, a project promoted by the municipal government of Alta Floresta to reforest and restore the headwaters of rivers on small rural properties. The financial viability of the farm owes a great deal to the support received from the non-governmental Ouro Verde Institute (IOV), which in addition to providing technical assistance, created a mechanism for on-line sales, creating links between farmers and consumers, Oliveira pointed out. The Solidarity-Based Marketing System (Siscos), launched in 2008, is“an on-line market that allows direct interaction between 30 farmers and over 500 registered customers, zootechnician Cirio Custodio da Silva, marketing consultant for the IOV, explained to IPS. Customers place weekly orders, the system chooses suppliers and picks up the products to be delivered to the buyers in a shop on Wednesdays. Besides, Siscos supports sales in street markets, and the school feeding programme, which by law in Brazil buys at least 30 per cent of its food products from family farmers, and the women textile workers’ network, who make handcrafted textiles. The IOV, founded in 1999 in Alta Floresta to drive social participation in sustainable development, especially in agriculture, has promoted since 2010 a network of native seeds, to encourage reforestation and crop diversification. Seed collectors organised in a 115-member cooperative, with 12 seed banks, 200 selected tree species, and mainly oilseeds for agriculture, represent an activity that is also a source of income, said agronomist Anderson Lopes, head of that area at the IOV. seeds of native tree species, for the restoration of forests, springs and headwaters, and degraded land, he said. Silva and Lopes have similar backgrounds. Their farming families, from the south, ventured to the so-called Portal of the Amazon, a region that covers 16 municipalities in northern Mato Grosso, where the rainforest begins. It is a territory with a rural economy, where one-third of the 258,000 inhabitants still live in the countryside, according to the 2010 national census. It is a transition zone between the area with the largest soybean and maize production in Brazil, in north-central Mato Grosso, and the Amazon region with its dense, sparsely populated jungle. This is reflected in 14 indigenous territories established in the area and in the number of family farmers – over 20,000 – in contrast with the prevalence of large soybean plantations that are advancing from the south. The road that connects Sinop – a kind of capital of the empire of soy – with Alta Floresta, 320 km to the north, runs through land that gradually becomes less flat and favourable for mechanised monoculture, with more and more forests and fewer vast agricultural fields. That tendency is accentuated towards Paranaita, a municipality with a population of 11,000 people, 54 km west of Alta Floresta, which announces the last frontier of livestock farming and soy monoculture, at least through that south-north highway across Mato Grosso, the national leader in the production of soy. Movements in favour of sustainability, such as the one supported by IOV, and the important presence of family farmers, are joining forces to help curb the invasion of the Amazon region by soy monoculture which dominated north-central Mato Grosso, creating a post-harvest desert-like landscape. Another non-governmental organisation, the Center of Life Institute (ICV), also active in Alta Floresta and surrounding areas, has a Sustainable Livestock Initiative, with reforestation and restoration of degraded pastures. The “colonisation” process of the Portal of the Amazon was similar to that of the rest of Mato Grosso. People from the south came with dreams of working in agriculture, after previous waves of loggers and “garimpeiros” – informal miners of gold and precious stones – activities that still continue but have become less prevalent. “Many of those who obtained land harvested the timber and then returned south,” because planting crops was torture, without roads, marketing or financial support, recalled Daniel Schlindewein, another migrant from Paraná who settled in Sinop in 1997. Agriculture failed with coffee, rice and other traditional crops that were initially tried, until soy monoculture spread among the small farms, rented from the large producers. But family farming has survived in the Portal of the Amazon. “If the town of São Pedro didn’t exist, I would have to close the store in Paranaíta,“ Pedro Kinfuku, the owner of a chain of four supermarkets in the area, told IPS. He opened the stores in 2013 betting that the construction of the Teles Pires Hydropower Plant nearby would generate 5,000 new customers. “But not even a tenth of what was expected came,“ he lamented. 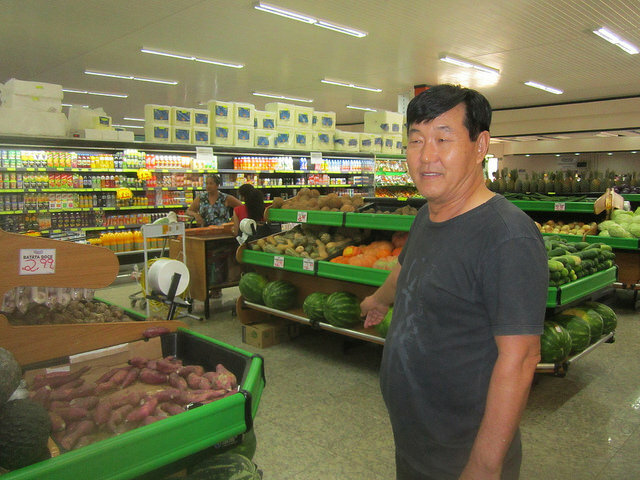 The 785 farming families who settled in São Pedro, near Paranaíta, saved the local supermarket because they mainly buy there, said Kingfuku, the son of Japanese immigrants who also came from Paraná. “Among the settlers, the ones who earn the most are the dairy farmers, like my father who has 16 hectares of land,” said Mauricio Dionisio, a young man who works in the supermarket.